A must-have reader for all technology migration projects! The HYBRID from STid brings together 125 kHz proximity identification technology and 13.56 MHz MIFARE® &DESFire® EV1 identification technologies to give you the best of both worlds for your security or e-money applications. The LXS HYBRID is a rugged, vandal-proof proximity reader that brings together 125 kHz and 13.56 MHz. The advanced security and programming functions mean that a wide range chip technologies are easy to use - EM, HID, Nedap, Crosspoint and compatible with ISO14443 A and 3B and ISO18092: Mifare Ultralight, Classic (1kB, 4kB), Ultralight C, Mifare Plus (S and X, 2kB and 4kB), DESFire, DESFire EV1 and specific applications like CPS3 cards, NFC transactions or Moneo cards. If you need to set up a complex multi-site configuration, the LXS HYBRID can be used to read a range of different cards: technology migration becomes easy, whatever the configuration you use. 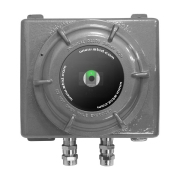 Mini LXM 125 kHz proximity Dual technology reader designed to address with simplicity and performance the expectations of modern and affordable access control systems. Very compact and discreet with its elegant design it integrates easily any environment. Traceability and identification of high-value assets in explosive environments! The GAT nano is an extremely compact high performance UHF reader. 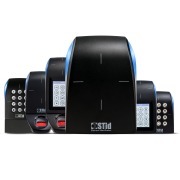 It has been developed for hands-free access control applications and can identify people moving with a total coverage area up to 3 m.
STid presents the first upgradable range of High Security card readers, combining the RFID MIFARE®, Bluetooth® Smart (Low Energy) and NFC (HCE) technologies. Architect® Blue is a secure user-friendly identification solution which makes your mobile phone the access key. The Security Industry Association (SIA) awarded STid with its Mobile Apps trophy for its secure andintuitive access control solution, STid Mobile ID®. The Security Industry Association (SIA) awarded STid with its Mobile Apps trophy for its secure and intuitive access control solution, STid Mobile ID®. Following on from its Innovation Trophy at the Expoprotection fair with its Architect® range of modular readers, STid has won the “Think Outside the Box” award with its new mobile access control solution - STid Mobile ID®. The innovative manufacturer STid and its integrator Unicacces were selected by the prestigious French bank Banque Populaire Provençale et Corse (BPPC) to provide them with a secure multi-application access control solution. ODEON chooses Alcea and STid for security of the tallest tower in Monaco! STid is a French company with a worldwidereach that specializes in contactless RadioFrequency IDentification technologies (RFID,NFC & Bluetooth®). We invent and providesolutions in the security and industrialasset track and trace markets for the mostdemanding industries. STid is proud to present the first modular range of MIFARE® DESFire® or LEGIC® secure readers, offering both flexibility and simplicity. The Architect® readers are based on a smart common RFID core that can be connected to additional interchangeable modules: card reader, keypad, touch screen, biometrics?